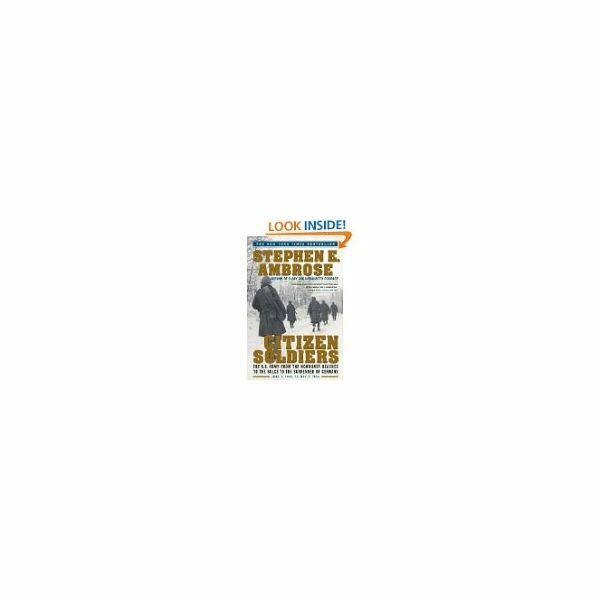 Here we continue from Part I of our series on Citizen Soldiers by Stephen E. Ambrose. vehicles designed for open space. Individuals with ingenuity were adapting the tanks for the landscape and improving ground-to-air and tank-to-infantry communication daily. In these next chapters, the soldiers will emerge from the shadowy lanes of the hedgerows and attempt to take advantage of the Allies' superiority in mobility, airpower, and their ability to supply a steady flow of fresh troops. Attention shifts from the concerns of managing tactics, men and machinery in an unexpected terrain to mobilizing armies through occupied nations and maintaining supply lines as the front moves further inland. As military historian Russell Weigley wrote, "The soldier's battle of Normandy was about to become the generals' battle of France." Continue reading for questions and ideas for learning about and teaching WW II. What word or words would you use to describe the experience of intense bombing described by Ernie Pyle on page 83? Do you think this is common in contemporary warfare? Try to find examples about men and women serving today to explain your answer. Use newspaper article, magazines, blogs, etc. This is a link to the award winning Bouhammer's Afghanistan and Military Blog–it's an excellent choice of the millions out there. Was the role of lance corporals in the German army similar to that of NCOs (corporals and sergeants) in the American army? Did the German lance corporals and American NCOs receive the same type of affection and respect from their men? Be able to back up your answer by explaining the similarities or dissimilarities. Teacher Tip: Patton's desire to forego Brittany and crush the Germans in France is compared to a "roundhouse right" by Ambrose while the mission Patton was given was called a "short right hook". (See Chapter 3, pg. 90) For fun, see if there's a boxing expert in the class and have him (or her) explain the difference. It might help to clarify the strategies and break up the routine a little. Reconsider your answer to question 5 from Chapter 3 in light of the supply crises. Does this information change your answer? Explain. Veterans of combat began to develop varying attitudes towards the war and their role in fighting it. Note the three different quotes regarding fighting on page 120 and describe the attitudes they reveal. The Siegfried Line – Also known as the West Wall, the Siegfried Line was a fortified stretch of pillboxes and guns created to defend Germany on its western frontier. Built in the 1930s, Hitler reinforced it in 1944 and German soldiers held this line following their retreat from France. Pillbox – Basically a bunker made of reinforced concrete and used to hold men and machine-guns. 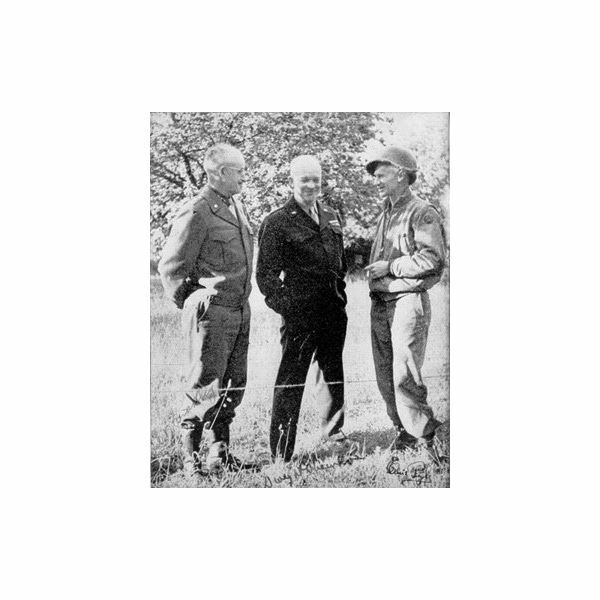 General Bradley – Dubbed the “GI General” by journalist Ernie Pyle, General Omar Bradley commanded the US First Army on D-Day and was later given lead of the Twelfth Army Group. Panzer-Lehr – an elite German armored unit. St.-Lo-Periers Road – Highway running east-to-west along the front lines in France in July 1944. Cobra – Code name for an operation meant to get the Americans out of the hedgerows and expose the German lines in the area between St. Lo and Lessay. Heavy air bombardment was to be followed by artillery, tanks, and infantry creating a breach in the lines that could be exploited by Patton’s waiting army. It was designed to get the troops further east and south. Ernie Pyle – A famous, widely-read war correspondent who had great respect for infantrymen.Working for the Scripps-Howard newspaper chain, he covered World War II in North Africa, Sicily, Italy, France and the Pacific where he was killed by a sniper on the island, Ie Shima. Brittany – region in western France.